Workman Publishing Company, 9780761184577, 144pp. Introducing an incredible storytelling package—a full-color, 144-page book paired with a collection of 20 six-sided, beautifully illustrated storytelling cubes that make it easy for any imaginative child (and that is every child) to start creating wonderful stories. Roll the blocks, and you can make anything happen, to anyone, anyplace in this or any other world. The book is a guide to the principles of creative storytelling. It covers the essential elements like conflict—that thing that no one likes in real life, but without which no story could ever start—characters, motivation, dialogue, theme, and, of course, the climax. As you turn the pages, you’ll be prompted to roll the story blocks. And that’s when the magic starts to happen. The blocks are coded by color, each loosely associated with a part of speech. A simple exercise about motivation, for example, asks the reader to roll the blocks and find one red block (person or animal) “who wanted nothing more in this world than to” one green block (action). Depending on the outcome, the reader might end up telling a tale of a cowboy who just wanted to dance or a mummy who wanted to race cars. How to Tell a Story combines the surprising whimsy of Mad Libs with the compelling fun of storytelling cubes. Its exercises and games will have readers mastering the basics of storytelling while exercising their creative muscles. And who knows where that journey will end? Daniel Nayeri is the author of several books for young readers, including Workman’s How to Tell a Story and Straw House, Wood House, Brick House, Blow. He lives with his family in Jersey City, New Jersey. Brian Won is an illustrator and children’s book author. He lives in Southern California with his family. "Finally, an educational toy that recognizes the important role that storytelling plays in the growth and development of young minds. (Loud whisper: 'It’s fun, too!')" -Brad Bird, writer and director of The Iron Giant and Pixar’s The Incredibles and Ratatouille. One of Huffington Post Canada's Hottest Kids' Books of 2015! "An epic game of endless possibilities...You can play/read it in so many of different ways." "How to Tell a Story is like a creative writing workshop in a box...an absolutely wonderful way to stimulate creativity while learning how to be a better storyteller." 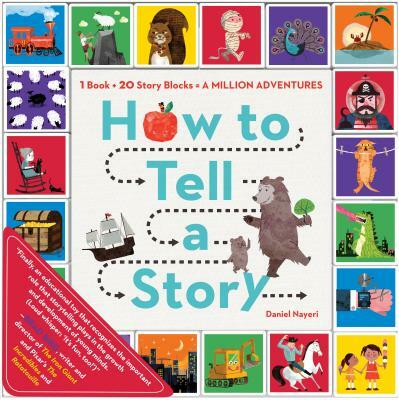 "How to Tell A Story by Daniel Nayeri combines a color book with a custom set of 20 illustrated blocks to create an ingenious way to learn how to tell a story -- from beginning to middle to end." "How to Tell A Story is a veritable creative writing master class series made brilliantly accessible through playful blocks of color and category - practically an Iowa creative writing workshop for kids. Middle-schoolers in particular will respond to Daniel Nayeri's wit and wisdom."